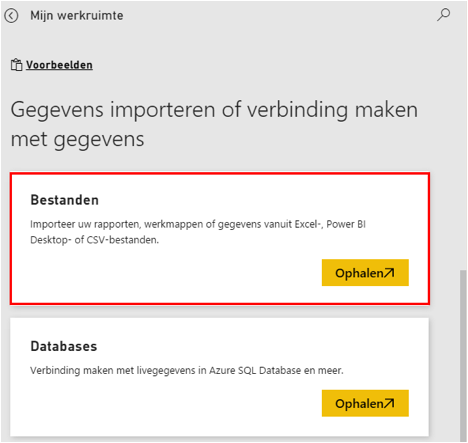 In the previous tutorial we created an Excel file in which we imported data via MS Power Query. Read the article. 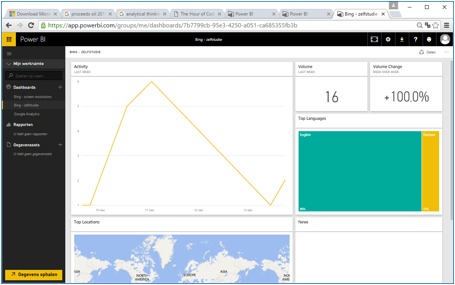 Power BI is a cloud based analytics service. It is a cool free tool which is part of Office 365. 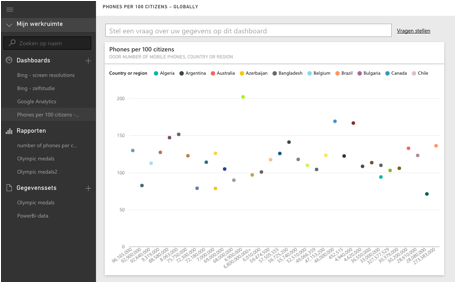 This tool allows to import, visualize and analyze data; by simply drag and drop you can execute complicated queries, create reports and ask simple questions. Data can be monitored live by any device. This smart tool interprets data automatically. It allows to import data via Excel but also via Services like Google Analytics, Bing, Git, etc. 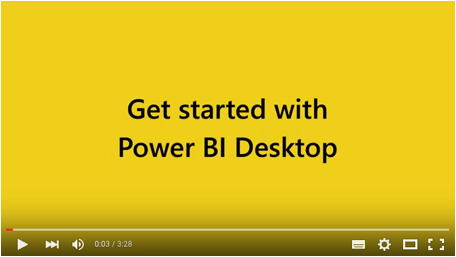 Navigate to www.powerbi.com or http://powerbi.microsoft.com. Hit the button Sign In. Sign in using your Office 365 account. Let’s import the data we saved in our Excel file. Hit the button in the Files section. 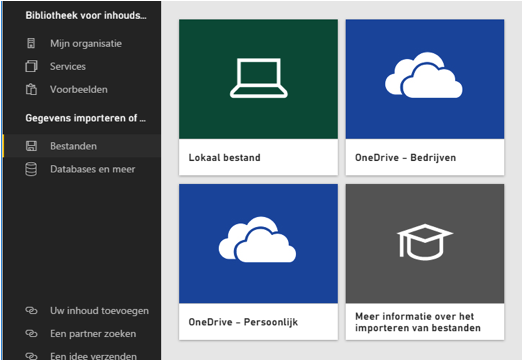 Choose your source: Local file or OneDrive. The first step is creating a data set. Choose a kind of statistic on the right and drag this to your canvas. 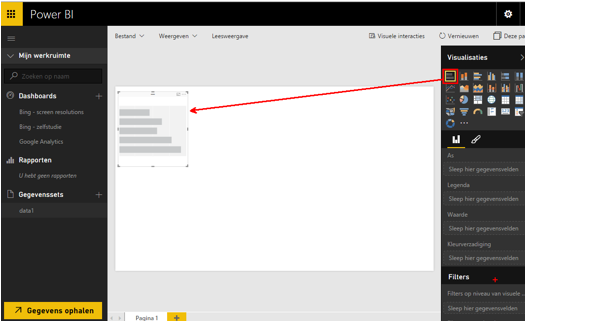 Select fields in the sidebar at the right side. The statistics will be automatically created. You can easily switch from pie to bars etc. From the moment you save this data set, a new report will be created. By pinning stats at the upper right corner using the button, you can save statistics to a dashboard. Choose new or existing dashboard and hit the button pin. You can repeat by creating new data sets, save them as reports and pin these on your dashboard so this dashboard will be loaded with facts and statistics. The dashboard offers a very cool feature: the Q&A. This is more than a search box. Simple questions will be instantly converted into elaborate stats. 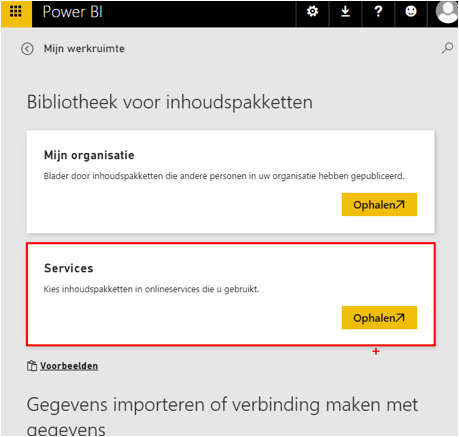 Power BI allows to import data from lots of different services: Google Analytics, Github, Bing, Mailchimp, etc. 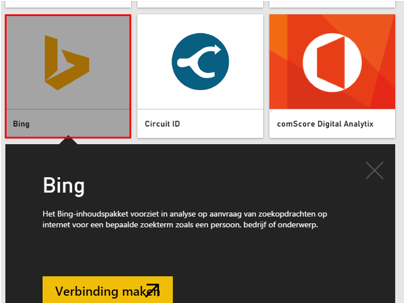 In this tutorial we will import data from Bing. Hit the button in the Services section. Choose a Service. 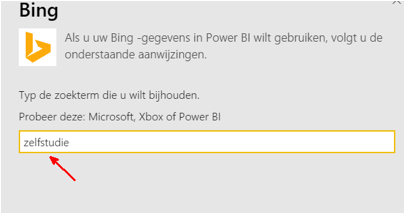 Let’s give Bing a try. This service offers you insight into the frequency specific keywords have been searched. 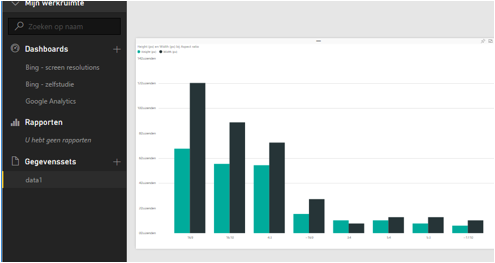 Power BI will import your data and create a dashboard containing all kinds of statistics. 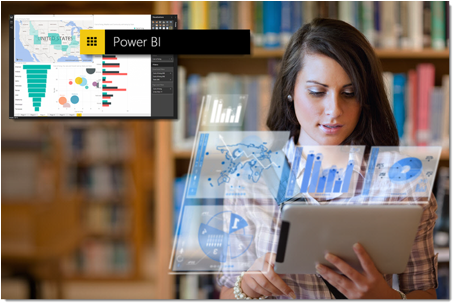 Power BI is also available as a standalone tool: Power BI desktop.